This box of DocLab Premium Face Ampoule from Korea came in just the right time when my skin need hydration boost. The heat, dryness, pollution and air conditioning can have detrimental effects on our skin moisture level to drop. The skin sometimes gets tight, shows dry lines and the texture of the skin will be rough. 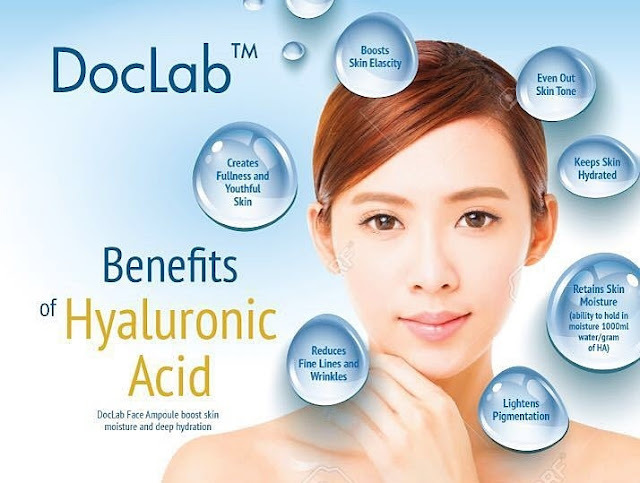 Here is a box DocLab Premium Face Ampoule that claims to help to boost skin moisture and deep hydration with their Hyaluronic Acid technology. Each box contains 5 face x 2ml ampoules for face. The packaging is convenient and hygiene, whereby every ampoule is 2ml packed in a small brownish glass bottle and sealed with air tight cap. Each ampoule is suitable for 1 time use and once open has to apply it immediately. It is recommended to use 1 ampoule per day and to see the best result use it for consecutive 5 days. The texture is like clear liquid without any color or scent. It penetrates very fast into my skin and leaves a smooth finishing without any stickiness or oily. Usage: always apply the ampoule after cleanse and tone. Massage Techniques: these are 4 simple massage techniques that we can follow to increase the product efficacy. Step 1: Pour an appropriate amount on the palm and apply them on the cheeks, chin and forehead. Use fingers to gently massage the cheeks to enhance penetration and repeat 3 times. Step 2: Use the middle and ring fingers to massage up from the nasolabial folds to the ridge if nose. Step 3: Use all fingers massage diagonally to enhance penetration and repeat 3 times. Step 4: Use all fingers to massage up the chin line to enhance penetration and finish up with the firming massage. Apply the remaining on the neck and massage. Immediately after application skin feel comfortable, hydrated and ready for the next product application. The first time I use it was in night time. After cleanse and tone I applied the face and neck then followed by the massage techniques printed at the back of the box. The next day when I wake up my skin I can see there is a layer of skin moisture and my skin don’t look so tired or yellowish. Then I continue to use it in the morning, throughout the day my skin don’t feel any tightness even I drive under the hot sun. The skin hydration is balance, I don’t dry or oily, t-zone is not so shiny after lunch and my makeup last longer. I finished the rest of the 3 ampoules in 3 days. Best is 1 day 1 ampoule. 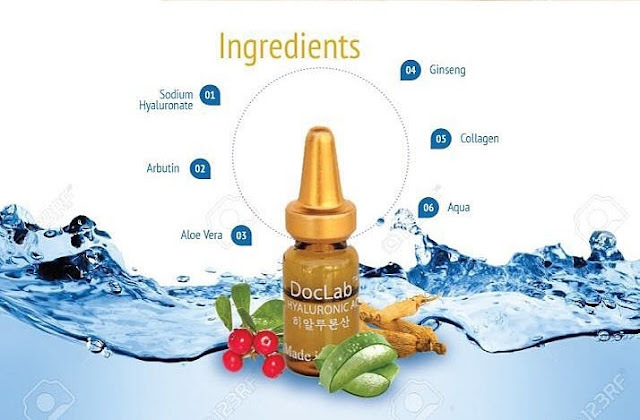 Overall it was a pleasant experience using DocLab Premium Face Ampoules. It gives me a very comfortable and soothing feeling after application. My skin hydration became balanced, skin texture is smoother, skin radiant improves, makeup last longer and look more natural. I personally think in order to see more visible result we should use more than 1 box and have to use it consecutively. Please take note that this Face Ampoule is for external use only. Avoid contact with eyes. Store it in dry and cool place. This is going to be a huge help during the summer when your skin needs to be hydrated. Your face looks so nice after using it for 5 days, it's definitely worth trying. This really sounds like a great product for hot summers or really cold winter where a more powerful hydration is needed. Very comprehensive review! With the heat outside, this product is good for moisturizing the skin. Korean beauty products are really good, so I think this one is effective.